I printed up these onesies for Birdy this weekend. I've had these old letterpress stamps kicking around my house for years and I've always kind of wondered if they would actually work for printing. I just never tried. And even though it is the end of May and I just turned up my heat, I know that eventually summer will arrive and Birdy will be pretty much living in onesies. So of course, I need to "cute them up" a bit. This project took me all of five minutes. And I am seriously resisting the urge to put a big letter B on anything and everything. Birdy hasn't told me if she likes them or not. When I tried to get a photo of her she was screaming. She's such a baby. But every time I snap open her sleepers to reveal the big B on her chest, I feel like there's a super hero lurking underneath. I’m making a little “g” t shirt for an afternoon birthday party. time to get out the freezer paper. So cute! I would have to resist as well… ahhh wooden block letters! Very cute onesies! I love how you took stuff you had around the house to personalize her clothes. Love your blog by the way. I’ve been reading for weeks now. I don’t comment much but am trying to do more of it! I LOVE saying that… “sheesh! he’s SUCH a BABY!! !”it’s funny to me, and to you too? !it’s nice to see you Molly!!! So adorable! I am looking for cute projects for creating unique onesies for our nephew arriving next month! I have a bunch of onesies I’ve been meaning to “cute up” for the various babies around me – this seems like a great idea and way faster than, say, embroidery. eek, so cute! I have been seeing so many cute fabric+ink crafts and freezer paper stencils.. I really need to try it! Very sweet–I love the cheerful colors! Oh, now that is cute!! What a great idea! This is adorable, and looks like much less work than my go-to onesie decoration of freezer stencils. I’ll have to keep my eyes open for good stamps. I’ve always loved letterpress stamps ever since my dad owned a print shop and I used to play with them and spell out my name. Ever since he sold the shop I’ve been on the lookout for them. I recently found some at an antique fair. I’m so happy to see them being used and loved by others. You’re blog is fantastic and looks so effortless. It took me a while to understand not every post has to be perfect or convey a message, but I’m glad when one does. Congrats on the new baby and looking forward to your next post. darling! I need some of those. We have one K shirt and I love it. These are super cute! My 2 year old solves the cape problem by wearing a bib backwards and yelling ‘super baby’ as she leaps about. I love the stripey effect. Those onesies are the cutest! Oh, next to Birdy that is. Hello, sweet SuperBirdy! Your mama is a peach, as I suspect you are as well. it was so easy, you’ll definitely have to try it! jennifer–i usually do embroidery or applique, too. and this was so much faster. i think i’m going to need a whole alphabet of block letters! i’ve yet to try the freezer paper stencils. i think it’s the tedious cutting out that holds me back. but i really *mean* to try some day soon. hi nancy! i’d love to see pix of the kittens when you get the chance. we currently have our last litter of kittens–everyone else has been spayed and neutered. they’ll be weaned in a week or so and then the momma is off to the clinic, too. rachel took beautiful DC pix, didn’t she? hi kate. 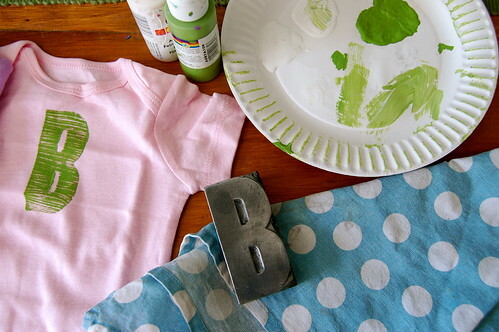 I haven’t tried freezer paper stencils yet, but this was super easy. if i have a “K” in my stash, I’ll whip you up a few. I just have to find them! I’m sure it would work with foam stamps, too. I used the small bottles of acrylic paints that come in tons of colors at any craft store and usually sell for about $1 or so each. For this project, I simply painted the acrylic on to the stamps with a brush. Then I use my hair dryer to “speed dry” the paint and set the color. I’ve never had any trouble with them fading. Usually the cloths wear out before the prints. i love the backwards bib! must remember…. love the onsies! so fun and simple. these look gorgeous! Cool idea! I was smiling and nodding until that last bit about the cape. Snorted right out loud on that one! I just read your post about comments (I’m a little behind…) so I’m going to delurk and say that I LOVE this. So simple but striking. 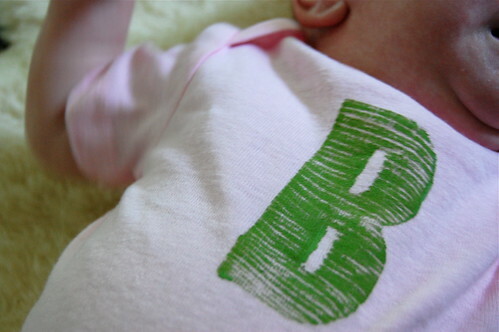 Onesies don’t work well for my tall babe, but now I want to find a big C and get to work on all her t-shirts.